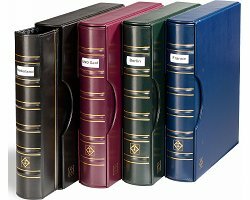 Our popular Classic GRANDE binders are now also available with labelling fields. These labels allow you to organise and clearly display your collection. Changes to the label can be made simply by exchanging the card insert, which is protected by an additional clear film insert. To fill your binder, choose from our comprehensive range of GRANDE sheets. Binder holds up to 60 sheets. Bound cover and robust 4 D-ring mechanism and matching slipcase. Overall size: 295 x 335 x 70 mm (11 2/3 x 13 ¼ x 2 ¾ ’’).